First-timers and seasoned Italy travelers often want to travel to the main cities like Rome, Florence and Venice. 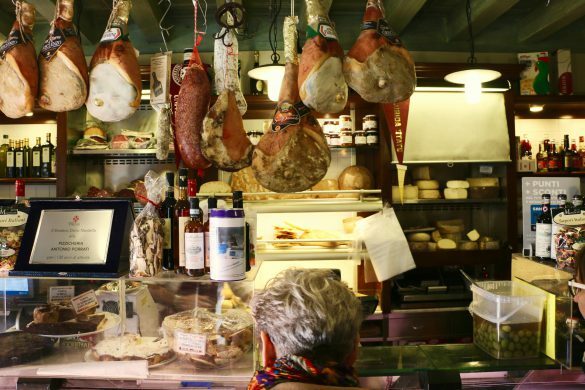 Just as often, however, travelers tell us how much they want to visit quaint towns in Tuscany. With endless olive groves and gorgeous vineyard landscapes, Tuscany is home to a host of charming towns and villages. 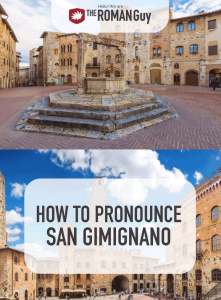 One of the most beautiful towns to visit in Tuscany is San Gimignano, which is often nicknamed “Medieval Manhattan.” In this guide, you’ll learn a little history about San Gimignano, what to do and see when visiting and of course, how to pronounce it. Tuscany is the beloved northern region of Italy most known for its vineyards and countryside beauty. To access these beautiful rural towns and vineyards, it’s easiest to travel from Florence and visit the countryside on day trips from Florence. 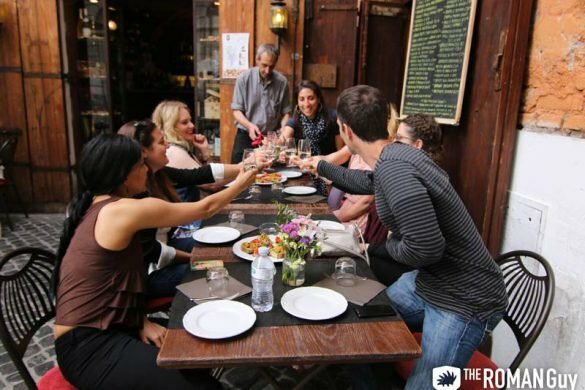 While in Florence, however, be sure to soak up the city’s history and culture on one of our many Florence tours. 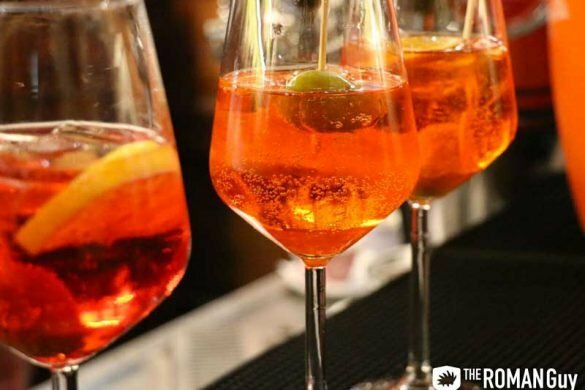 Then, take a relaxing Tuscan wine tour the next day. So, let’s get this out of the way. It’s pronounced Sahn Jee-Meen-YAH-Noh. 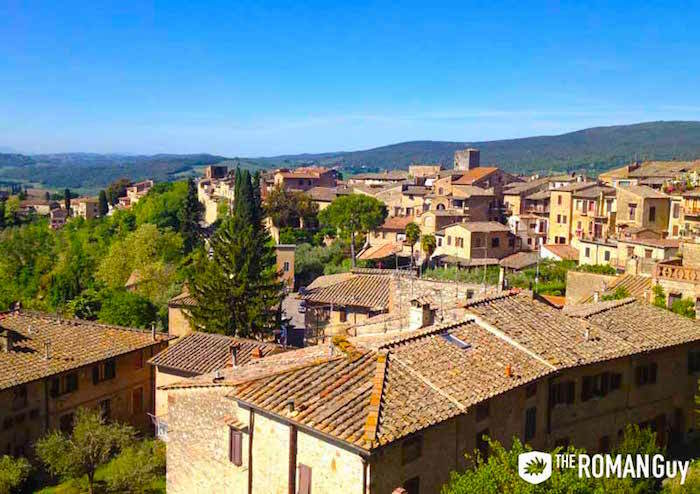 San Gimignano is a hilltop town in the province of Siena, another beautiful town to visit while in Italy. When looking at San Gimignano from afar, the medieval architecture almost looks like a line of skyscrapers since the town sits atop a hill. Like most Italian cities and villages, San Gimignano has been around for a couple thousand years. As the legend goes, San Gimignano came about after two brothers, Silvio and and Muzio, escaped Rome after committing the conspiracy of Catiline. They fled Rome and moved out to the yet-to-be-developed countryside and built two castles. This new area came to be San Gimignano. The iconic San Gimignano towers used to be used as refuge for families during battle. During the 14th century, however, Florence took control of San Gimignano. Many of the towers were reconfigured during this time, and only 14 of its original 72 towers remain. Located in Piazza del Duomo, the Palazzo Comunale is the municipal palace of San Gimignano. Built in the late 13th century, the palace contains a beautiful courtyard, reception hall and art gallery. The palace’s reception hall is often known as the Sala di Dante, dedicated to famous Florentine poet Dante Alighieri. Dante visited San Gimignano in 1300 as a Florentine ambassador. You can actually see where he used to live on our Florence walking tour. In the art gallery, you can find beautiful works of Renaissance art by artists such as Filippo Lippi and Benozzo Gozzolil. 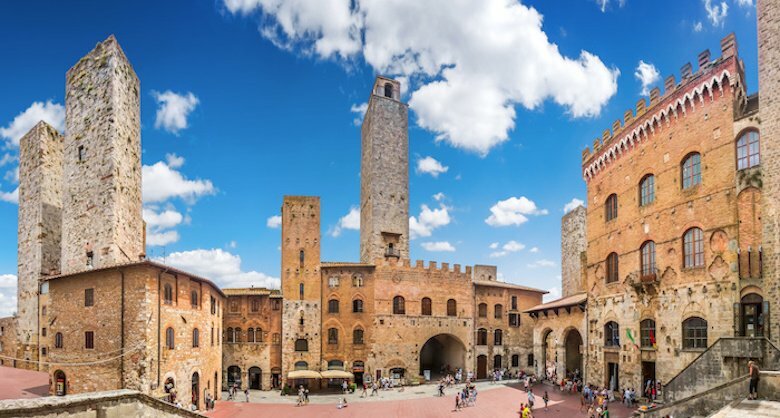 Protruding from Palazzo Comunale is Torre Grossa, a large charming tower that visitors can climb to see the beautiful views of San Gimignano. Built in 1310, Torre Grossa is San Gimignano’s tallest tower. Next to the Torre Grossa and Palazzo Communale is the Duomo di San Gimignano. Many of Rome’s cities, towns and villages have their very own Duomo. This major church and minor basilica is even considered a UNESCO World Heritage Site. Like those of thousands of churches in Italy, the frescoes inside of this duomo are incredibly beautiful. While inside, discover the church’s Romanesque style and colorful frescoes. Connected to Piazza del Duomo by a small passageway, Piazza della Cisterna is another one of San Gimignano’s most charming piazzas. In the center, you can find a large octagonal well capped by a beautiful archway. 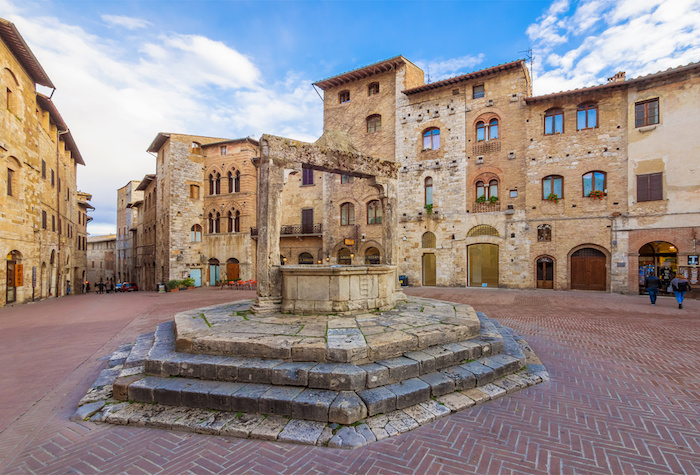 The well feeds into the San Gimignano cistern, dating back to the thirteenth century and inspiring the name for this local piazza. Even during the winter, you will find a line out the door of Gelateria di Piazza. Trying out a local gelato shop is absolutely essential when visiting a new Italian city. Pro tip: get a scoop of gelato just before the sun sets and watch the gorgeous landscape from the hills of San Gimignano. If you want us to arrange your private transfers in Florence (and beyond! ), contact us today. Follow our adventures in Italy on Facebook, Instagram and YouTube.